Manchester, NH Construction is underway at design-build firm, PROCON. 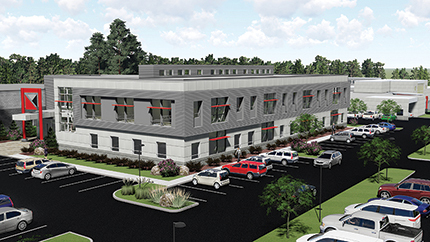 In June 2018 work began on a two-story, 26,000 s/f expansion to PROCON’s headquarters. The new building will house the company’s construction operations and administrative teams, as well as adding some essential new spaces. This will be the company’s second large-scale construction project on home turf since the 2014 opening of their award-winning architectural and engineering department offices. Needless to say, PROCON looked no further than its in-house team of A/E/C experts to design and build their new space. PROCON’s CEO and chairman Mark Stebbins requested an open-concept collaborative space with high ceilings and lots of natural light. The architectural team responded with a design that expands on the industrial look of their previous A/E/C renovation. The overall industrial spaces will showcase high ceilings, mixed materials, exposed structural and mechanical systems, and rustic yet streamlined accents to achieve a modern aesthetic. Neutral colors will be accentuated with splashes of the PROCON brand red in the carpet, wall tile, wall coverings and furniture textiles. To reinforce the industrial look, some of the light fixtures will feature pipes and exposed bulbs. The new lobby’s reception desk will be a mix of cast-in-place concrete, reclaimed wood and a large steel beam. Also included is a large cafeteria with an adjoining training room, a full kitchen, offices and conference rooms. Team collaboration will be optimized by work “pods,” large standing height tables for laying out drawings, sit-down meeting tables and conference rooms. An abundance of natural light will be provided through the connecting corridor’s skylights and oversized windows. The entire company will also benefit from this expansion. The existing cafeteria area has grown too small to sustain the company’s year-round professional development training. A larger multi-functional café was designed to hold approximately 25 to 30 people with assorted seating plans, a full kitchen, vending zone and a coffee bar area. The enlarged area will be used for company-wide meetings, and an operable partition will subdivide the room into two - providing a dedicated space for the training sessions. The company has literally doubled in size over the last four years and successfully completed projects in nearly every commercial market sector throughout the Northeast. Multiple factors have been part of their success; first, their unique fully-integrated architecture, engineering and construction management team under one roof; second, their long-standing business partnerships and a dedicated workforce. The company has also harnessed the benefits of cutting-edge technology to optimize their developer-centric approach to project delivery. The results speak for itself in a 95% repeat business, and under 6% employee turnover that is unprecedented in the construction industry. The company has also been honored with multiple industry awards, such as Excellence in Construction from the ABC NH/VT, the Business Excellence award from NH Business Review and the Business NH Magazine “Best Companies to Work for” to name a few. And in 2018, the 4-generations-strong company was ranked by Business NH Magazine as one of the Top Family Businesses. In summary, as the thunder of heavy equipment shakes the very ground under their feet, PROCON’s employees are excited to have a front row seat as the highly anticipated building begins to take shape for a 2019 opening.